Mayor of Chittagong City Corporation Mr. A.Z.M Nasir Uddin took a decision in 2017 to develop Tobacco Free Chittagong City before 2040. With the aim to develop the tobacco free city a discussion meeting on “Tobacco Free City & our responsibilities” held on 14th July 2018 in the K.B. Abdus Sattar Auditorium of Chittagong City Corporation. The meeting was presided over by Mr. Md. Arifur Rahman, Chief Executive of YPSA. In the meeting Mr. A. 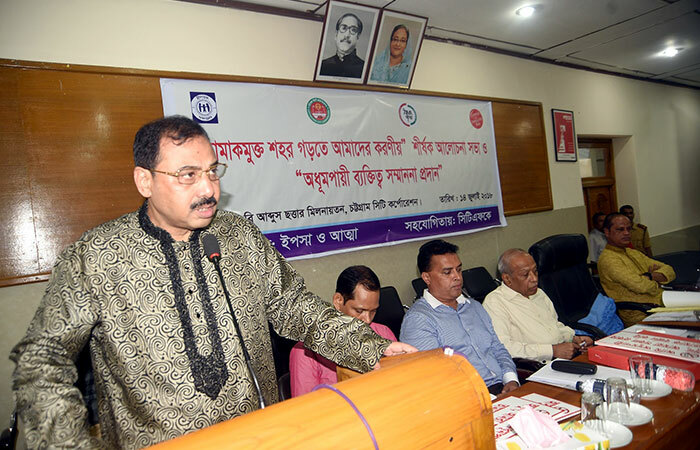 Z. M. Nasir Uddin, Mayor of Chittagong City Corporation declared that he will effectively implement the plan for ensuring the Tobacco Free Chittagong city and non smokers will get priority in all recruitment process of Chittagong City Corporation. He emphasized that awareness and enforcement of law both are very important for ensuring tobacco free city. He also advised to develop an action plan for implementing the tobacco free city program based on the proposed plan presented by YPSA in the meeting. Mayor also raised a demand to ban all types of tobacco production, tobacco marketing and tobacco use in Bangladesh. The meeting was jointly organized by YPSA and ATAM, Chittagong Region with the support of Campaign for Tobacco Free Kids. Chittagong City Corporation also provided support to arrange the meeting. 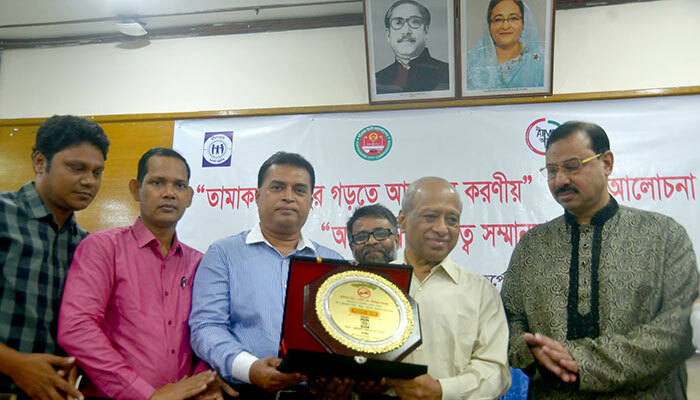 YPSA and ATMA showed honor to four renowned personalities in Chittagong for their contribution on tobacco control & as nonsmoker person and handed over crest to them. They were Mr. A. Z. M. Nasir Uddin, Mayor of Chittagong City Corporation, Professor Dr. Iftekhar Uddin Chowdhury, Vice Chancellor of Chittagong University, Mr. Abu Sufian, Ex president of Press club & Director of Rupali Bank limited and Professor Dr. A.Q. M Serajul Islam, Professor and Head of Department (Retired) of Skin and Venereal disease department of Chittagong Medical Collage & Hospital. Professor Dr. Iftekhar Uddin Chowdhury, Vice Chancellor of Chittagong University said that boundary has been made for stopping tobacco cultivation in Chittagong University. 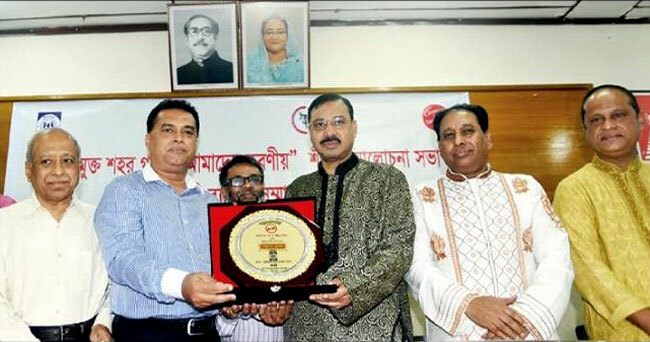 He thanked YPSA on behalf of 50,000 students, teachers and officials of Chittagong University for giving him the award. He also said that he will work with YPSA for ensuring tobacco free University. Professor Dr. A.Q. M Serajul Islam said that political will is very important to control tobacco consumption, tobacco production and safe the youth generation from tobacco harms. All the guests also hold boards with a message for expressing their consolidation on Tobacco Free City and for inspiring people to leave all types of tobacco products as a part of campaign. Mayor has inaugurated the display of 10,000 No smoking signage printed by Chittagong City Corporation and all the participants and guests declared together that they will never smoke tobacco in future. In the meeting Dr. Mahafuzur Bhuiyan, Grant Manager of CTFK Bangladesh, Mr. Shuklal Das, Secretary of Chittagong Press club, Mr. Hasan Murad Biplob, Councilor of CCC and Ms. Latifa Ansari Luna, Member of ATMA were delivered their speech. Mr. Alamgir Sabuj, Convener of ATMA, Chittagong delivered the welcome speech and Ms. Nasim Banu, Team Leader of Tobacco Control project of YPSA presented tobacco control situation, progress of TC initiatives in Chittagong and the proposed plan for implementing tobacco free city. Councilors & Officials of Chittagong City corporation, teachers, doctors, representatives from business community, journalists, NGOs, smoke free coalition members, students, youth groups and ATMA members also participated in the meeting.